Photograph, from an album of 62 views of India and Ceylon. It was reproduced in Montague Massey, 'Recollections of Calcutta for Over Half a Century' (Calcutta, 1918), and there credited to Johnston & Hoffmann. View from inside Fort William, looking across the buildings of the fort towards shipping moored on the Hooghly. The High Court can be seen on the skyline in the right background. Fort William was initially built in 1707 and in 1742 a defensive moat was dug to fortify it against threat of attack by the Marathas. In 1757 when Robert Clive retook Calcutta from the forces of Siraj-ud-Daulah, the Nawab of Bengal, a new Fort William was conceived and constructed within ten years. 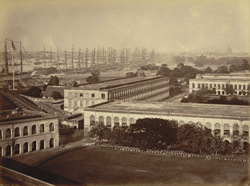 In the process, large swathes of jungle were cleared around the fort, an esplanade was created, and in the following decades the levelled ground provided ample space for the erecting of the glittering white colonial structures which impressed Calcutta's visitors and made it look a prosperous imperial city.